The Path to Adulthood... the time has come to leave childish things behind and become adult Garou. But all pups must first pass a test: a rite of initiation into the harsh life of Gaia's defenders. Many fail this rite, and some do not survive. Fraught With Danger The cubs begin their trial into adulthood. But something goes wrong. Forced into events dangerous to even grown warriors, the cubs must survive the assaults of blizzards, enraged Garou and evil Banes to prevent the Black Spiral Dancers' dark plot from hatching. They must marshal all of their new powers to survive in this age of Apocalypse. 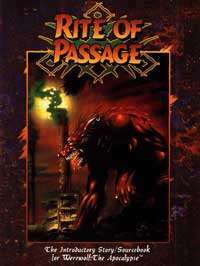 Rite of Passage includes: A story wherein characters begin their rite of passage, the most important event in a Garou's life. It includes all the information a beginning Werewolf Storyteller needs to start a chronicle. Five pregenerated characters, complete with detailed backgrounds and characters sheets. Source material on the savage horrors taking place in Saskatchewan, horrors which threaten the very world.